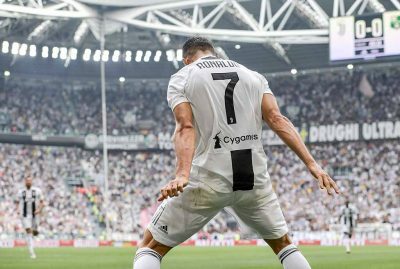 Cristiano Ronaldo’s wait for his first Juventus goal ended when he tapped in a straightforward opener against Sassuolo in Serie A – and he quickly added a second for the Old Lady’s 2-1 home win at the Alliance Stadium, Turin, on Sunday. The 33-year-old Portugal superstar poked home at point-blank range to break the deadlock five minutes into the second half. The highly anticipated came in his fourth Juve appearance and with his 28th attempt in Serie A, the same number it took him to get off the mark for Real Madrid in LaLiga last term. Khouma Babacar nodded in Sassuolo’s only goal of the match at the dot of 90th minute from a fine assist by Cristian Dell’Orco.